IIIFamily Health Program, Family Health Association, municipality of São Paulo. IV Family Health Program, Family Health Association, municipality of São Paulo. IVDepartment of Professional Guidance, School of Nursing, University of São Paulo. Translation from Interface - Comunicação, Saúde, Educação, Botucatu, v.13, n.30, p. 121-134, Jul./Sep. 2009. Keywords: Educação permanente em saúde. Continuing education. Work. Healthcare human resources. In-service education. Palavras-chave: Educação permanente em saúde. Educação continuada. Trabalho. Recursos humanos em saúde. Educação em serviço. Investigación con el objeto de analizar la práctica de actividades educativas de trabajadores de salud en Unidad Básica de Salud (UBS) según las concepciones de educación permanente en salud (EPS) y de educación continuada (EC), proceso de trabajo en salud y enfermería, trabajo en equipo e atención integral. Estudio del tipo transversal realizado en diez UBS del municipio de São Paulo, por medio de entrevista dirigida con 110 informantes clave representantes de todas las categorías profesionales y equipos de las UBS, sobre las actividades educativas desarrolladas en 2005. Las informaciones se clasificaron según categorías operacionales para cada variable de estudio con base en el referencial teórico. Los trabajadores relataron 396 actividades educativas que revelan la complementariedad de las concepciones de EPS y EC. De acuerdo con la perspectiva del Sistema Unico de Salud (SUS) y de la transformación de las prácticas de salud se plantea la necesidad de ampliación en el debate en torno de la EPS como política pública. Palabras clave: Educación permanente en salud. Educación continuada. Trabajo. Recursos humanos en salud. Educación en servicio. Healthcare workers constitute an indispensable component in attaining healthcare service objectives and concluding work processes. Within this, they constantly need to seek out and access opportunities to reflect on practices, scientific and technological updates and dialogue with users, the population and other workers who form part of the services. Observation of capacitation processes among healthcare workers has demonstrated that the least developed aspect of these processes is assessment (Davini, Nervi and Roschke, 2002). Studies contributing towards this topic have indicated that capacitation has a weak impact on the quality of healthcare services (Viana et al., 2008; Merhy, Feuerwerker and Ceccim, 2006; Peduzzi et al., 2006; Torres, Andrade and Santos, 2005; Ceccim and Feuerwerker, 2004). Thus, educação permanente em saúde (EPS)2 has been highlighted as a national policy for training and development among healthcare workers, given the connection between the possibilities for developing these professionals' education and expansion of the problem-solving capacity of the healthcare services. The aim in this public policy is that the reference point for these workers' capacitation processes should be people's and populations' healthcare needs, the administrative needs of the sector and the needs for social control within healthcare (Brazil, 2007, 2004a, 2004b). Saúde; SUS) as a structural factor that should seek to place value on healthcare work and workers. This document also specifies that regional implementation of the national EPS policy should take place through the Regional Collegiate Administrations, with participation from the Permanent Commissions for Education-Practice Integration (Comissões Permanentes de Integração Ensino-Serviço; CIES). These administrative levels were envisaged in the regulations for the Healthcare Pact and they participate in formulating, implementing, monitoring and evaluating EPS actions. EPS proposals were launched by the Pan-American Health Organization at the start of the 1980s, with the aim of revising the concepts of and reorienting healthcare workers' capacitation processes. The learning basis for these proposals was the day-to-day work carried out in healthcare services and was organized as a continual process of participative and multiprofessional nature (Haddad, Roschke and Davini, 1994). These proposals are governed by Paulo Freire's transformational and emancipative pedagogical concepts and have been constructed based on the notions of significant problem-addressing learning that this author disseminated. Thus, they consist of educational processes that seek to promote transformations in healthcare and educational practices (Faria, 2008; Ceccim, 2005b). Conceived of in this way, EPS recognizes the educational nature of work itself, which becomes understood not only in its instrumental sense of producing results and of actions directed towards a given aim that was defined previously, but also as a space for addressing problems, reflecting, conducting dialogue and constructing consensuses through which it becomes possible to promote changes and transformations from the perspective of comprehensiveness of healthcare (Ceccim, 2005b, 2005c; Ceccim and Feuerwerker, 2004; Paim, 2002). According to Pedroso (2005), in healthcare services, the human resources sector is still strongly marked by personnel administration procedures. Responses to development demands are separate events centered on technical-scientific capacitation and are disconnected and fragmented. Often, there is no linkage to healthcare needs. However, this author highlights that these continuing education (CE) activities are important for consolidating SUS, given that they can to some extent "close the gap that exists between training and the real needs of the healthcare system" (Pedroso, 2005, p.92). The CE concept, which is recognized within human resources management in different production sectors, including in the healthcare sector, has also been going through changes and expansion. Some authors have been associating it with possibilities for organizational transformation and with construction of knowledge that comes back into the organization itself and into the professions, from considering the workers' subjective dimensions (Peres, Leite and Gonçalves, 2005). It can be seen that the transformation perspectives of CE are directed towards organizations, individuals and professions, and not towards social practices, as indicated by EPS. The concepts of EPS and CE are therefore different, and their differences are grasped in a publication from the Ministry of Health (Brazil, 2004a) and in the literature on EPS (Faria, 2008; Saupe, Cutolo and Sandri, 2008; Viana et al., 2008; Ceccim, 2005a, 2005b, 2005c; Ceccim and Feuerwerker, 2004; Paim, 2002; Haddad, Roschke and Davini, 1994). These papers allow them to be differentiated in that EPS is grounded in the concept of education as a process of significant transformation and learning that is centered on day-to-day implementation of work processes; on placing value on work as a source of knowledge; on placing value on the linkage with healthcare, management and social control; and on recognizing that practices are defined by multiple factors relating to multi-professionalism and interdisciplinarity, with contextualized and participative educational strategies aimed towards transformation of such practices. CE is grounded in the concept of education as transmission of knowledge and in placing value on science as a source of knowledge. It takes place separately, in a fragmented manner, and is constructed in a manner that is not linked to management and social control, with its focus on the professional categories and technical-scientific knowledge of each area. Its emphasis is on courses and training that are constructed based on diagnoses of individual needs, and it is placed within the perspective of transformation of the organization to which the professional belongs. EPS is related to the concept of comprehensiveness, which was analyzed by Mattos (2004, 2003) along three lines of meaning: the first, applied to the characteristics of healthcare policies in the sense of linking together preventive actions and health recovery and promotion; the second, linked to expanded contextualized understanding of healthcare needs; and the third, in the manner of healthcare service organizations seeking to link together different levels of complexity of healthcare, interdisciplinarity, multi-professionalism and intersectorality. Although healthcare work tends to be individualized and fragmented, teamwork has been recommended since the 1970s, and this constitutes an alternative for recomposing the specialized work towards comprehensiveness (Peduzzi, 2007a, 2001). The view taken is that teams are constructed during the collective work process and have some plasticity. Their composition, duration and work dynamics may vary as a function of greater efficacy and effectiveness of care and the quality of service provision. Collective work today is characterized by subdivision and production of alienation among workers in relation to their own work process, its context and its results. However, despite alienation factors, it has to be taken into consideration that the broken unity between conceiving and carrying out work, making decisions and actions may be reconstituted in the work process through continual use of the workers' capacity for assessment and discernment. Thus, going beyond reiteration of work models that are already established and dominant, spaces for change in healthcare work processes can be configured. Education at work thus falls into a context of tension, in which there are possibilities both to merely reproduce the technicity and normativity of work and to configure opportunities to reconstitute work processes, in such a way that healthcare workers will be able to recognize, negotiate and respond more pertinently to users' and the population's healthcare needs. In this manner, it is sought to secure rights and quality in service provision, from the perspective of strengthening SUS. It can be understood that in a certain way, workers' educational activities should originate in and be implemented close to the realities of their work, so that this stimulates contextualized addressing of problems and promotes dialogue between public policies and the singularities of places and people (Brazil, 2004a). However, a recent study evaluating human resources within primary care in the state of São Paulo demonstrated that central municipal institutions are the place where capacitation is mostly carried out, and that primary healthcare units (PHUs) are little used for this purpose (Viana et al., 2008). Within the context of SUS public healthcare policies and the theoretical framework adopted, the educational activities of primary healthcare workers were studied from a microsocial perspective, i.e. from work carried out on a day-to-day basis, with the aim of analyzing educational activity practices among healthcare workers at PHUs according to the concepts of EPS and CE. This was a cross-sectional study that was linked to a larger research project named "Analysis on educational activities among healthcare and nursing workers and teams: characteristics, surveying of needs and results expected" (Peduzzi, 2007b). This study was carried out in a central region of the municipality of São Paulo that had 14 PHUs for approximately 400,000 inhabitants. It was a healthcare action and service network with the power to resolve primary care and medium complexity cases. Of these PHUs, 13 were under the responsibility of the Central-Western Regional Healthcare Coordination Office and its respective Technical Healthcare Supervision Offices, and one was linked to a public university. Out of this total number of PHUs, there were four losses. One was due to refusal to participate and the others were because one PHU was undergoing building renovations, another was accommodating the professionals from the unit undergoing renovations and the third was implementing the family health strategy during the field survey period. Thus, the final sample was composed of 10 PHUs, which were identified by means of letters (A, B, C, D, E, F, G, H, I and J). Four of them were differentiated through the presence of family health teams (FHT) at these units. The FHTs had been implemented starting in 2001 in different situations: PHU-A, with two FHTs linked to the programmed action model; PHU-C and PHU-E, with six FHTs; and PHU-J, with three FHTs and two teams of community health agents belonging to the Community Health Agents' Program3. PHU-E and PHU-J were named mixed units because they had FHT and also a set of healthcare professionals who were not part of the teams. Table 1 presents the distribution of the healthcare workers and work teams according to the respective PHUs4, with the aim of characterizing the units studied. This information demonstrated that the units were all of differing size, ranging from 121 workers (18.9%) to 31 (4.8%). Work teams were only present in the four PHUs in which FHTs had been implemented (A, C, E and J) and in PHU-D, which had a mental health team. Data-gathering was done at three PHUs (A, E and J) between July and November 2005, with surveying of data on educational activities that took place between July 2004 and June 2005. After support had been obtained from the funding agency and from the Observatory of Human Resources for Health, the data-gathering was extended to the other PHUs between April and November 2006, in relation to data from the whole of the year 2005. One hundred and ten directed interviews were held with key informants nominated by the unit managers (mean of 11 per PHU). These informants were representative of all the professional categories and work teams at each location. The instrument was composed of questions asking about topics such as: type of educational activity (including the content covered), target public, educational strategies, place where the activity was conducted, origin of the demand and duration (in hours). All the interviews were recorded and transcribed, and the information was systematized into operational categories. It was decided to map out the PHU healthcare workers' educational activities from interviews with key informants because until mid-2006, there were no systematized records of such activities. It was only at that time that it was possible to locate, through members of the Healthcare Workers' Training and Development Center (CEFOR), Municipal Health Department of São Paulo, records of educational activities among healthcare workers within the municipality, which started with data relating to 2005. In view of the EPS approach relating to the perspective of the day-to-day work routine, and the distinction between EPS and CE, it was sought to ascertain whether the healthcare workers' educational activities were anchored in the work process. For this, operational categories were drawn up for each study variable, based on the theoretical reference point. 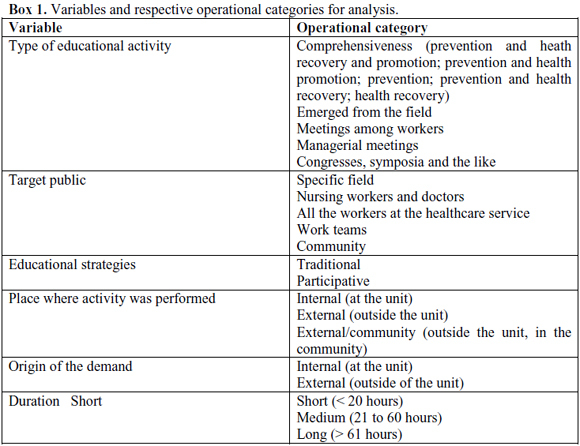 The aim of drawing up these categories was to make it possible to analyze the PHU healthcare workers' educational activities through empirical investigation (Box 1). This classification was initially made by the field investigator at each PHU, followed by presentation in a research meeting with the project coordinator, for discussion and validation. Categorization regarding the "type of educational activity" was done based on the name of the activity and the respective material covered. Activities with names and content that related to some degree of linkage of prevention actions and health recovery and promotion were initially classified in the operational category "comprehensiveness". In view of the correlation between comprehensiveness and EPS, these activities were grouped as an expression of EPS. Activities that were spontaneously reported as "Educational activities with users that were educational for the workers" and "presence of students at the unit as an educational process for workers" were placed in the category "Emerged from the field". Considering that these activities were directly anchored in the work process, they were interpreted as an expression of the EPS concept. Activities referred to as meetings covering healthcare-related material, PHU management or both care and management were categorized as "meetings among workers" and were taken to be close to EPS, given that this places value on the links with healthcare and management, and aims towards multi-professionalism and interdisciplinarity. Activities of administrative and managerial nature were classified as "managerial" and those that related to scientific events were classified as "congresses, symposia and the like". These activities were interpreted as in tune with CE, since this is governed by placing value on science as a source of knowledge and on possession of technical-scientific knowledge. The variable "target public" was classified as "specific field", "nursing workers and doctors", "all workers at the unit", "work teams" and "community". The first two operational categories were considered to be close to CE and the others, in tune with EPS, since they aimed towards multi-professionalism and interdisciplinarity, and also expressed the connection between educational processes among workers and social control and participation among the population. It is worth emphasizing that the target public was named a "specific field" for educational activities aimed towards each of the professional areas within healthcare, as well as separately for community health agents, nursing workers (nurses, auxiliaries and nursing technicians) or, generically, for healthcare professionals. In the classification "educational strategies", strategies were taken to be "participative" if they stimulated workers' participation (such as group discussions, workshops, presentational classes with discussion and presentational classes with practice), with the potential for implementation of EPS in the unit. Presentational classes, panels, seminars and the like were taken to be "traditional" strategies that were more in tune with CE. Activities originating in the PHU itself and which take place there are more likely to have a greater chance of counting on the workers' participation, given that these workers may be direct players in the processes of both identifying the capacitation needs and implementing the capacitation. They may also more closely express the user/population's needs (managers and workers). Thus, the "place where the activity was carried out" was categorized as "internal", external" or "external/community", and the "origin of the demand" was categorized as "internal" or "external". The place and an origin of the demand that was "internal" to the unit were considered to be close to the concept of EPS, while demands that were "external" to the unit were more in tune with CE. Finally, the "duration" was categorized as short (< 20 hours), medium (21-60 hours) and long (> 61 hours). The variables were distributed as frequencies and proportions. To find whether associations existed between the variables and the units studied, the Fisher test was used (Armitage and Berry, 1994), taking the significance level to be 5%. Among the variables with statistically significant associations, standardized residuals expressed as standard deviation units were calculated. Analysis on these residuals made it possible to ascertain which categories were contributing towards the association, since they were values with a one-to-one relationship with the likelihood of occurrence. In these cases, values greater than 1.96 or less than -1.96 had a small chance of occurrence (+ 2.5%) and could indicate cutoff points for excess or lack of occurrences, respectively (Pereira, 1999). The database was structured in Excel, version 2.0, and the statistical analysis was performed using the Statistical Package for the Social Sciences (SPSS), version 12.0. This study was approved by the Research Ethics Committees of the School of Nursing, University of São Paulo and the Municipal Health Department of São Paulo. All the study subjects were consulted and they agree to participate through signing a free and informed consent statement. The healthcare workers at the PHUs investigated reported 396 educational activities. The results are presented for each variable, starting with presentation of the frequency of each operational category for the set of units studied, followed by analysis on the behavior of the PHUs, which demonstrated associated results (Table 2). 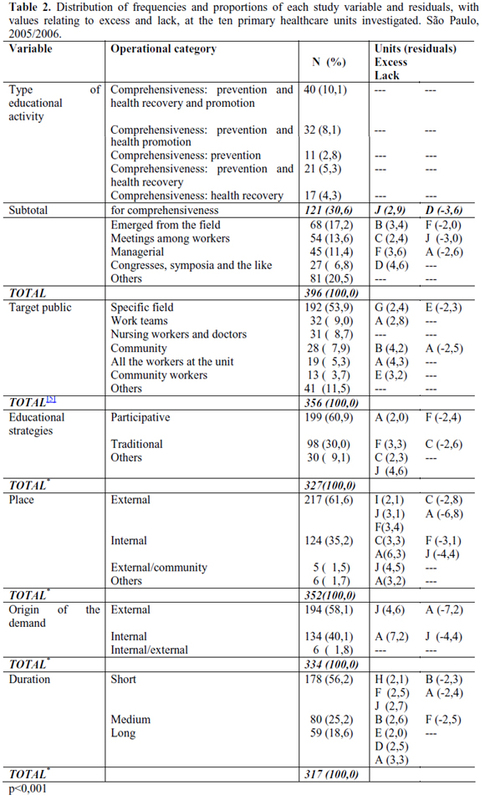 With regard to the type of educational activity, 121 activities (30.6%) were classified in the category "comprehensiveness", which represented the largest proportion of the set of educational processes, with excess in unit J and lack in unit D. Following this, 68 activities (17.2%) corresponded to those named "emerged from the field", with excess in unit B and lack in unit F. There were 54 activities (13.6%) in the category "meetings among workers", which were greatest in unit C and least in unit J. There were 45 activities (11.4%) in "managerial", with excess in unit F and lack in unit A. There was a smaller number of activities named "congresses, symposia and the like" (27; 6.8%), with excess in unit G and no unit lacking this activity. Among the total for the target public, "specific field" was the most frequent category, with 192 (53.9%), presenting excess in unit G and lack in unit E. Following this, 32 (9.0%) corresponded to "work teams" (care and managerial); 31 (8.7%) to "nursing workers and doctors"; 28 (7.9%) to "community"; 19 (5.3%) to "all the workers at the unit"; 13 (3.7%) to "community workers"; and 41 (11.5%) to "others". In this category, excess of "work teams" and "all the workers at the unit" were observed in unit A, and of "community" and "community workers" in units B and E, respectively. A lack was only observed in unit A, regarding the variable "community". Regarding the educational strategies, 199 (60.9%) were "participative", with excess in unit A and lack in F, followed by 98 (30.0%) that were "traditional", with excess in unit F and lack in unit C. Lastly, there were 30 (9.1%) in "others", with excess observed in two units (C and J). In relation to the place where the educational activities were developed, 217 (61.6%) were held "external" to the unit and 124 (35.2%), "internal". Among the "external" activities, there were excesses in units I, J and F and lacks in units C and A, while among the "internal" activities there were an excess in units C and A and a lack in units F and J. In the places with smaller proportions, i.e. "external/community" with five (1.5%) and "others" with six (1.7%), excesses were observed in units J and A, respectively. None of the PHUs presented a lack in these two categories. Regarding the origin of the demand for educational activities, the largest proportion had an "external" origin (194; 58.1%), while 134 (40.1%) were of "internal" origin. In the "external" category, an excess was seen in unit J and a lack in unit A. Conversely, in the "internal" category, an excess was seen in unit A and a lack in unit J. Analysis on the duration of the educational activities in the ten PHUs, 178 (56.2%) were of "short" duration, followed by 80 activities (25.2%) of "medium" duration and 59 (18.6%) of "long" duration. The two extremes ("short" and "long") presented excess in units H, F and J and in units E, D and A, respectively. There was a lack of "short" duration activities in units B and A, but there was no lack of "long" duration activities in any units. In the "medium" duration category, excess and lack were seen in units B and F, respectively. 2002; Schraiber and Mendes-Gonçalves, 1996). However, precisely because comprehensiveness is considered to be a mark of primary care, it has to be asked why only 10.1% of the workers' educational activities were directed towards linkage with preventive actions and health recovery and promotion actions. The manner in which preventive actions and health promotion actions are implemented, and their aims, also deserves to be questioned. In other words, it can be asked whether these actions effectively seek to expand healthcare concepts and to intervene in their determinants. This relates to the second usage of the term "comprehensiveness" (Mattos, 2004), presented previously, but it goes beyond the scope of this study. Educational activities oriented towards comprehensiveness (30.6%) plus those classified as ones that emerged from the field (17.2%), which maintain the view that the day-to-day work routine is, in itself, educational for workers, accounted for 47.8% of the educational actions for professionals directly related to healthcare. The emphasis on these activities is appropriate, given that the purpose of the units' activities, or the aim of healthcare work processes, is to provide for users' and the population's healthcare needs. The educational actions reported, such as meetings among workers, point towards EPS and work team, since these are tools applied through communication and interaction among the professionals, thereby constructing spaces for exchange, negotiation and consensus-seeking. It can be considered to be pertinent that both meetings and activities of managerial nature appeared in smaller proportions than did those directly related to healthcare, which was the final aim of such activities. The target public for the educational activities in the units studied was taken to be an expression of the concept of workers' education prevailing at these locations. This may have been on the one hand closer to EPS when actions oriented towards work teams and community workers predominated; or on the other hand, closer to CE when activities aimed at specific fields prevailed (Viana et al., 2008; Merhy, Feuerwerker and Ceccim, 2006; Ceccim, 2005b; Haddad, Roschke and Davini, 1994). If educational activities aimed towards the target public of one specific professional field predominate, this corresponds to fragmentation of healthcare actions and the tradition of individualized work according to categories as the way of organizing the healthcare work process. In this respect, investigation of human resources actions within primary care has demonstrated that capacitation for specific professional sectors, centered on techniques, does not ensure comprehension of day-to-day routine situations of the teams' work processes. There is a shortage of educational processes aimed towards all workers at PHUs (Viana et al., 2008). Nevertheless, even if educational activities aimed towards teams are only a small proportion of all educational activities, they stimulate linkage among the workers and integration of healthcare practices around a common project (Peduzzi, 2007a, 2001). This indicates that changes in the fragmented, individualized, verticalized and hierarchical work practices, towards work with social interaction, are occurring, even if this is only just beginning (Ceccim, 2005a). Results from recent studies have revealed that teamwork prevails in PHUs as a primary care model that has been implemented and which is aimed towards the healthcare needs of users and the population (Peduzzi, 2007a). It has also been shown that in this type of healthcare service, the target public should preferably be composed of teams of workers (Saupe, Cutolo and Sandri, 2008). Participation by community workers in healthcare education activities and EPS points towards a developing assumption of responsibility among users for their health conditions, participation in the day-to-day routine of the service, the importance of the worker/user relationship and organization of public services through analysis, presentation and defense of their interests in decision-making councils at municipal, state and federal levels (Kleba, Comerlatto and Colliselli, 2007; Crevelim and Peduzzi, 2005; Cortes, 2002). Workers' educational activities structured from the particular features of organizing the work and the community's needs may enable changes in healthcare practices. EPS correlates with these matters and develops from reflections on the work process (Ceccim and Feuerwerker, 2004). Also in this respect, educational strategies can be understood from the presupposition that learning is dynamic and modifies behavior. The subject of the learning, the object to be grasped, the knowledge that results from interaction between subject and object and the instructor who facilitates this process are of great importance (Souza et al., 1999). Subjects may, through participative strategies and from their reference points of reality, construct new knowledge and reach objects completely. The results demonstrated that such strategies predominated among the set of units studied, which corroborates other studies on EPS within primary care (Saupe, Cutolo and Sandri, 2008; Silva, Ogata and Machado, 2007). It was also observed that the majority of workers' educational activities were accomplished externally to the service, which corroborates the results from a recent study evaluating human resources practices within primary care in the state of São Paulo (Viana et al., 2008). The World Health Report of 2006 (WHO, 2007) also points towards the fact that isolated courses given outside of the work environment have a poor history as modifiers of workers' current practices. The origin of the demand for educational activities was likewise predominantly external to the units studied. It can be understood that the demands for educational processes should arise from addressing the concrete problems of professional practice and not from individuals' need for updates: not solely guided from central and regional levels, but from the way the work is organized, taking into consideration the responsibility to provide comprehensive care that is humanized and of good quality for users (Ceccim and Feuerwerker, 2004). In this respect, the result shows the difficulty that the PHUs that were studied had in generating their own demands for educational activities through identifying their needs in local terms. The marked presence of external demands can be partly attributed to how the work process was organized and also to the structure and size of the PHU, which only had small numbers of personnel providing direct support for the unit management. This creates difficulty in putting education at work into operation as an instrument for the managerial work process. This result corroborates the previous report regarding the place where workers' educational activities are conducted, since both reports demonstrate that origins and activity locations external to the PHU predominate. With regard to the issue of healthcare workers' educational activities, practices diverging from the EPS concept are observed, given that the demand and the external location may not express the needs of the service and its workers. Even considering that the CIES may be an appropriate space for agreeing on workers' educational activities for the respective region, it can be understood that some time is still needed for this to become consolidated, given that recent research has shown that primary care coordinators recognize that there is a distance between the reality and the municipality's needs relating to healthcare workers' capacitation (Viana et al., 2008). There needs to be investment in linkage between central, regional and local levels. On the other hand, locations internal to the service and internal original of demands tend to favor participative planning and the possibility of greater correspondence with day-to-day routine work. In the present study, although lower proportions of long-duration activities (> 61 hours) appeared, it is worth highlighting that a recent study on workers' capacitation within primary care indicated that long-duration educational activities reduces worker adherence (Silva, Ogata and Machado, 2007). This may be related to the high dynamics of health sector work, thus impeding many workers from participating in long-duration educational activities during working hours (Viana et al., 2008). This study advances the knowledge of the topic of EPS, with operational categories drawn up for each of the dimensions that allow it to be distinguished from CE, namely: pedagogical concepts and presuppositions, target public, educational strategies, place where the activities were conducted, origin of the demand and purpose. This made it possible to carry out an empirical investigation on the topic, in order to analyze workers' educational activities within primary healthcare, based on the differences between EPS and CE. The limitations of this study relate to characterization of types of activity, and in particular their orientation in relation to comprehensiveness of healthcare, given that only the linkage of preventive actins and health recovery and promotion actions could be analyzed. Polysemy, which is one of the main characteristics of primary care, was not taken into consideration. Nevertheless, characterization of types of activity made it possible to identify the activities that were named "emerged from the field", which expressed the sense of EPS that this study took as its theme: the work process as a space for learning and placing new meaning on the work itself. The majority of participative educational strategies also point towards EPS, which recommends reflection on healthcare practices within collective discussion forums. On the other hand, with regard to other factors analyzed, practices governed by the concepts of CE were seen, especially among the target public, which was mostly composed of specific fields, to the detriment of educational activities destined for work teams and for the whole set of workers at the service. In addition, external origin of demand and external locations for conducting educational activities predominated. These last points express not only the presence of CE but also the difficulties that PHUs have in making use of the day-to-day routine work as a space for understanding and responding to the educational needs of workers at these services. These needs go from technical-scientific updates to critical reflection on practices. This emphasizes the need for PHUs to expand the educational actions for their workers within the day-to-day space of their own work. Thus, this study showed how the concepts of EPS and CE live together in educational actions among PHU workers in the region studied. Both are important for developing primary healthcare workers, because of their complementary nature: EPS, characterized through addressing health practice problems with multi-profession participation among the workers in order to correspond to the population's healthcare needs, may be linked to CE, which recommends technical-scientific foundations for specific professional fields in order to promote development of institutions. However, with regard to strengthening SUS and transforming healthcare practices, a need to expand the debate on EPS as a public policy implemented at local, regional, municipal, state and federal levels arises. It can be understood that linkage of efforts at the different levels of EPS policies, including the local level of PHUs, will enable advances in transforming workers' educational practices, thereby avoiding situations in which EPS would be reduced to a mere change of name relating to healthcare workers' development. The first author was responsible for writing the introduction, methodology and analysis of the empirical material of this study. The other authors participated in data gathering, analysis and final writing of the manuscript. ARMITAGE, P.; BERRY, G. Statistical methods in medical research. Oxford: Blackwell, 1994. BRASIL. Ministério da Saúde. Portaria nº 1.996/GM, de 20 de agosto de 2007. Dispõe sobre as diretrizes para a implementação da política nacional de educação permanente em saúde e dá outras providências. Diário Oficial da União, Brasília, DF, 22 ago. 2007. Seção 1. _____. Portaria nº 399/GM, de 22 de fevereiro de 2006. Divulga o Pacto pela Saúde 2006 - Consolidação do SUS e aprova as diretrizes operacionais do referido pacto. Diário Oficial da União, Brasília, DF, 22 fev. 2006. _____. Política de educação e desenvolvimento para o SUS: caminhos para a educação permanente em saúde. Brasília: Ministério da Saúde, 2004a. _____. Portaria Nº 198/GM, de 13 de fevereiro de 2004. Institui a Política nacional de Educação Permanente em Saúde como estratégia do Sistema Único de Saúde para a formação e o desenvolvimento de trabalhadores para o setor e dá outras providências. Brasília: Ministério da Saúde, 2004b. CAMPOS, G.W.S. Saúde paidéia. São Paulo: Hucitec, 2002. (Saúde em Debate). CECCIM, R.B. Onde se lê "recursos humanos em saúde", leia-se "coletivos organizados de produção em saúde. Desafios para a educação. In: PInHEIRO, R.; MATTOS R.A. (Orgs.). Construção social da demanda: direito à saúde, trabalho em equipe, participação e espaços públicos. Rio de Janeiro: Cepesc, 2005a. p.161-80. CECCIM, R.B. Educação permanente em saúde: desafio ambicioso e necessário. Interface -Comunic., Saude, Educ., v.9, n.16, p.161-77, 2005b. _____. Educação permanente em saúde: descentralização e disseminação de capacidade pedagógica na saúde. Cienc. Saude Colet., v.10, n.4, p.975-86, 2005c. CECCIM, R.B. ; FEUERWERKER, L.C.M. O quadrilátero da formação para a área da saúde: ensino, gestão, atenção e controle social. Physis, v.14, n.1, p.41-65, 2004. CORTES, S.M.v. Construindo a possibilidade da participação dos usuários: conselhos e conferências no Sistema Único de Saúde. Sociologias, v.4, n.7, p.18-49, 2002. CREVELIM, M.A. ; PEDUZZI, M. Participação da comunidade na equipe de saúde da família: é possível estabelecer um projeto comum entre trabalhadores e usuários? Cienc. Saude Colet., v.10, n.2, p.323-31, 2005 . DAVINI, M.C. ; NERVI, L.; ROSCHKE M.A. Capacitación del personal de los servicios de salud: proyectos relacionados con los procesos de reforma sectorial. Ecuador: OPS/OMS, 2002. (Serie Observatorio de Recursos Humanos de Salud, 3). FARIA, R.M.B. Institucionalização da política de educação permanente para o Sistema Único de Saúde: Brasil, 1997-2006. 2008. Tese (Doutorado) - Faculdade de Medicina, Universidade de São Paulo, São Paulo. 2008. HADDAD, J.; ROSCHKE, M.A.C. ; DAvInI, M.C. Educación permanente de personal de salud. Washington: Organización Panamericana da la Salud, 1994. (Serie Desarrollo de Recursos Humanos en Salud, 1000). KLEBA, M.E. ; COMERLATTO, D.; COLLISELLI, L. Promoção do empoderamento com conselhos gestores de um pólo de educação permanente em saúde. Texto Contexto - Enferm., v.16, n.2, p.335-42, 2007. MATTOS, R.A. A integralidade na prática (ou sobre a prática da integralidade). Cad. Saude Publica, v.20, n.5, p.1411-6, 2004. _____. Integralidade e a formulação de políticas específicas de saúde. In: PINHEIRO, R.; MATTOS R.A. (Orgs.). Construção da integralidade: cotidianos, saberes e práticas em saúde. Rio de Janeiro: Abrasco, 2003. p.45-58. MERHY, E.E. ; FEUERWERKER, L.C.M. ; CECCIM, R.B. Educación permanente em salud: uma estratégia para intervir em la micropolítica del trabajo en salud. Salud Colectiva, v.2, n.2, p.147-60, 2006. ORGANIZAÇÃO MUNDIAL DE SAÚDE - OMS. Trabalhando juntos pela saúde: relatório mundial de saúde 2006. Brasília: Ministério da Saúde, 2007. (Série B, Textos Básicos de Saúde). PAIM, J.S. Saúde: política e reforma sanitária. Salvador: Ed. ISC-CEPS, 2002. PEDROSO, V.G. Aspectos conceituais sobre educação continuada e educação permanente em saúde. Mundo Saúde, v.29, n.1, p.88-93, 2005. PEDUZZI, M. Trabalho de equipe de saúde na perspectiva de gerentes de serviços de saúde: possibilidades da prática comunicativa orientada pelas necessidades de saúde dos usuários e da população. 2007a. Tese (Livre-Docência) - Escola de Enfermagem, Universidade de São Paulo, São Paulo. 2007a. _____. (Coord.). Análise dos processos educativos de trabalhadores e equipes de saúde e de enfermagem: características, levantamento de necessidades e resultados esperados [relatório de pesquisa na Internet]. São Paulo: Escola de Enfermagem, Universidade de São Paulo, 2007b. Disponível em: <http://www.ee.usp.br/observatorio/observatorio/relatórios/re1092.pdf>. Acesso em: 15 out. 2008. PEDUZZI, M. et al. Qualidade no desempenho de técnicas dos trabalhadores de enfermagem de nível médio. Rev. Saude Publica, v.40. n.5, p.843-50, 2006. PEDUZZI, M. Equipe multiprofissional de saúde. Rev. Saude Publica, v.35, n.1, p.103-9, 2001. PEREIRA, J.C.R. Análise de dados quantitativos. São Paulo: Edusp, 1999. PERES, H.H.C. ; LEITE, M.M.J. ; GONÇALVES, v.L.M. Educação continuada: recrutamento e seleção, treinamento e desenvolvimento e avaliação de desempenho profissional. In: KURCGAnT, P. (Coord.). Gerenciamento em enfermagem: trabalho em equipe e processo grupal. Rio de Janeiro: Guanabara Koogan, 2005. p.138-56. SAUPE, R.; CUTOLO, L.R.A. ; SANDRI, J.v.A. Construção de descritores para o processo de educação permanente em atenção básica. Trab. Educ. Saude, v.5, n.3, p.433-52, 2008. SCHRAIBER, L.B. ; MENDES-GONÇALVES, R.B. necessidade de saúde e atenção primária. In: SCHRAIBER, L.B. ; NEMES, M.I.B. ; MENDES-GONÇALVES, R.B. (Orgs.). Saúde do adulto: programa e ações na unidade básica. São Paulo: Hucitec, 1996. p.29-47. (Coleção Saúde em Debate). SILVA, J.A.M. ; OGATA, MN. ; MACHADO, M.L.T. Capacitação dos trabalhadores de saúde na atenção básica: impactos e perspectivas. Rev. Eletrônica Enferm., v.9, n.2, p.389-401, 2007. Disponível em: <http://www.fen.ufg.br/revista/v9/n2/v9n2a08.htm>. Acesso em: 10 nov. 2008. SOUZA, A.M.A. et al. Processo educativo nos serviço de saúde. In: SAnTAnA, J.P.; CASTRO, J.L. (Orgs.). Capacitação e desenvolvimento de recursos humanos de saúde - CADRHU. Brasília: Ministério da Saúde/Organização Pan-Americana da Saúde/ Universidade Federal do Rio Grande do norte, 1999. p.215-32. TORRES, M.M. ; ANDRADE, D.; SANTOS, C.B. Punção venosa periférica: avaliação de desempenho dos profissionais de enfermagem. Rev. Latino-Am. Enferm., v.3, n.13, p.299-304, 2005. VIANA, A.S. d'Á. et al. (Orgs.). Recursos humanos na atenção básica, estratégias de qualificação e Pólos de Educação Permanente no Estado de São Paulo. São Paulo: Centro de Estudos de Cultura Contemporânea/Consórcio Medicina USP, 2008. (Cadernos de Atenção Básica: estudos avaliativos, 4). i Address: Av Dr. Enéas de Carvalho Aguiar 419, Cerqueira César, 05403-000 São Paulo, SP, Brazil. 1 Original research text produced with aid from FAPESP and from the Pan-American Health Organization/Ministry of Health. Workstation of the Observatory of Human Resources for Health, School of Nursing, University of São Paulo. Approved by the Research Ethics Committee of the School of Nursing, University of São Paulo, under procedural no. 423/2004/CEP-EEUSP, and by the Research Ethics Committee of the Municipal Health Department of São Paulo, in opinion report no. 034/2005 CEP-SMS. 2 In this paper, the Portuguese-language term "educação permanente em saúde" (EPS) has been maintained because there is no equivalent in the English language that allows the distinction made in Portuguese between the two types of educational activities for workers within healthcare services. The term EPS started to be used by the Pan-American Health Organization in the 1980s and appears clearly in the paper by Haddad, Roschke and Davini (1994). This term was adopted as a public policy for training and development of healthcare workers by the Brazilian Ministry of Health consequent to publication of Ordinance No. 198/GM of February 13, 2004 (Brazil, 2004a). The term refers to a proposal for workers' education specifically for the healthcare sector that seeks to take into account the specific features of this sector. In other words, it focuses of the healthcare needs of users and the population, with actions permeated by the relationship between users and workers and by interdisciplinary and interprofessional practices. 3 This was the situation of PHU-J during the data-gathering period, but from 2007 onwards, the unit had five complete FHTs. 4 The information on the numbers of workers and work teams in each PHU, which were extracted from the broader survey to which this study is linked, had the aim of characterizing the profile of these healthcare workers and these work teams in the study region.